Exceptionary attention to details and innovative design make Briggs and Riley luggage stand out from the crowd. It is as "simple as that". Briggs & Riley is relatively young company, founded in 1993. The philosophy behind the Briggs and Riley brand is clear. Their focus is on luggage that is exceptionally well designed and reliable. High quality is given... which is why Briggs & Riley offers the strongest guarantee in the industry. Innovative design on the other hand is not given but it is something the Briggs and Riley brand is passionate about. Briggs & Riley development team is always looking for ways to make more "intelligent bags". What do they mean by that? It means they are always looking for a smarter way to design Briggs and Riley bags, i.e. to make life easier for their customers. 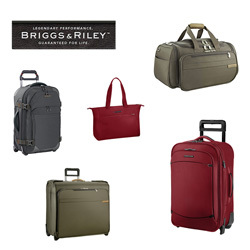 Briggs and Riley luggage includes some unique features and details specifically designed to help you to pack smarter. Briggs & Riley offers the strongest guarantee in the industry. They call it Simple as that®. There are no limits on the Briggs and Riley guarantee. Their lifetime guarantee covers not only ordinary wear and tear, it also covers airline damage and is good on every Briggs & Riley bag. Briggs & Riley luggage range reflects the fact that different travelers have different travel needs. The Briggs and Riley Baseline collection offers wide choice for the frequent travelers where the focus is on endurance and intelligent bag design. The Briggs and Riley Transcend and Explore collections offer relaxed functionality aimed towards the active leisure travelers. The Briggs and Riley @work and Verb collections are aimed towards the professional travelers, offering supreme organization and versatility to tech-savvy professionals on the move. Amazon offers good range of Biggs and Riley bags.